Animal Justice Canada Legislative Fund is working to enshrine meaningful animal rights into Canadian law, including the right of animals to have their interests represented in court, and the guarantee of rights and freedoms that make life worth living. 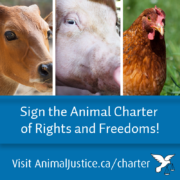 The Animal Charter is premised on the recognition that animals experience suffering and pleasure in a way that is not biologically distinguishable from that of humans; that discrimination on the basis of arbitrary characteristics—like species—is a violation of equity, natural justice and the rule of law; and that our legal system must not exclude the most vulnerable members of society. View and sign onto the Charter here.